Nobel Peace Laureate Archbishop Desmond Tutu Welcomed to Speak on "Good and Evil"
The Farquhar College of Arts and Sciences Division of Humanities welcomed Archbishop Desmond Tutu, Nobel Peace Laureate and human rights activist, as part of the college's Distinguished Speakers Series on Friday, February 26, 2010, from 7:00 to 8:30 p.m., in the Arena at the Don Taft University Center. Tutu presented "Good vs. Evil: Human Rights or Humans Wronged," corresponding to the college's 2009-2010 academic theme of "Good and Evil." The academic theme brings together the college's students and faculty to explore the relationship of good and evil within social, scientific, legal, religious, and political contexts. Awarded the Nobel Peace Prize in 1984 for his long fight against South African apartheid, Tutu was born in Klerksdorp and later moved to Johannesburg when he was 12. Unable to afford medical school, Tutu trained instead as a teacher at Pretoria Bantu Normal College, and he graduated from the University of South Africa in 1954. Under the system of apartheid-complete separation of the races-the South African government did not extend citizenship rights to blacks. It also implemented an inferior educational system, oppressive passport laws, and the forced relocation of black South Africans. 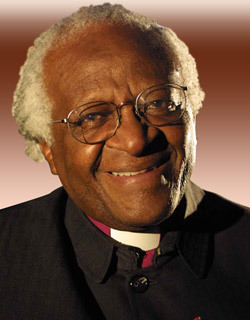 Determined to fight inequality, Tutu studied for the Anglican priesthood and was ordained in 1960. From 1962 to 1966, he lived in England and earned a master's degree in theology. He later taught theology in South Africa and then returned to England to serve as assistant director of the World Council of Churches in London. In 1975, Tutu became the first black African to serve as dean of St. Mary's Cathedral in Johannesburg. In 1978, he was named the first black Secretary General of the South African Council of Churches, giving him a broader opportunity to speak out against apartheid. Tutu denounced the apartheid system as evil and unchristian and demanded equal rights for black South Africans. He encouraged nonviolent resistance and advocated an economic boycott of the country. When the government revoked his passport to prevent him from traveling abroad, his case drew international attention. In 1984, he was awarded the Nobel Peace Prize with the Nobel Committee citing Tutu's "role as a unifying leader figure in the campaign to resolve the problem of apartheid in South Africa." He continued to fight apartheid as the first black Anglican bishop of Johannesburg in 1985, and his election as the first black African archbishop of Cape Town in 1986. In 1989, Frederik Willem de Klerk, then state president of South Africa, introduced reforms that eventually led to the downfall of apartheid and the release of anti-apartheid activist Nelson Mandela, who had spent 27 years in prison. Mandela and de Klerk shared the Nobel Peace Prize in 1993 for their roles in ending apartheid. In 1994, Mandela became president of South Africa in the nation's first fully representative democratic election. Mandela appointed Tutu to lead the Truth and Reconciliation Committee, whose mission was to investigate crimes committed during the apartheid era. In 1996, Tutu retired as archbishop of Cape Town, and he was named archbishop emeritus. In 2007, Tutu joined Mandela, former U.S. President Jimmy Carter, retired United Nations Secretary General Kofi Annan, and former Irish President Mary Robinson to form The Elders, a private effort to mobilize the experience of senior world leaders outside of the conventional diplomatic process. In 2009, President Barack Obama awarded Tutu the Presidential Medal of Freedom-the highest civilian honor-in recognition of his work to promote world peace. Tutu, who served as visiting professor of theology at Emory University in Atlanta, Georgia, is currently working on two books. Some of his previously published collections include Crying in the Wilderness, Hope and Suffering, and The Rainbow People of God.